Typhoid is caught by consuming food or drink that has been handled by someone who carries the bacteria Salmonella typhi ( S typhi), or if contaminated sewage gets into water used for drinking or washing food. Polluted water is the most common source. That's why typhoid is a worrying problem in disaster areas, where water supply and sewage disposal are disrupted.Typhoid fever is a major problem in the developing world, and is common in Africa and South America, but the greatest risk seems to be on the Indian subcontinent. These symptoms can be very severe and there's a one in ten risk of mortality unless treatment is given. With antibiotics, this can be reduced to one in 100, although resistance to antibiotic treatment is a growing problem. Multi-drug resistant strains of S. typhi have been reported in Asia, the Middle East and Latin America. 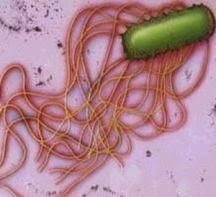 There are many types of salmonella bacterium, some of which occur in the UK and cause gastroenteritis but S. typhi is a more serious infection. There are 107 different strains of the S. typhi bacteria. Paratyphoid is caused by another salmonella, Enteritidis paratyphi A, B or C. It's similar to typhoid but usually gives a much milder infection. People who get typhoid carry the bacteria in their bloodstream and intestinal tract while they're ill. People can transmit the disease as long as the bacteria remain in their system. Most people are infectious just before, and during the first week of convalescence. About ten per cent of untreated patients will discharge bacteria for up to three months. A small number, about two to five per cent, will recover from typhoid but continue to carry the bacteria, shedding it in their faeces. These people are called carriers. Anyone traveling to a country where typhoid fever is a problem should be vaccinated against it. You can choose between a three-dose oral vaccine or a single-dose injection. Both are up to 75 per cent effective at preventing the infection, but there are important differences between them, including the cost and how long they offer protection for. Because none are 100 per cent effective, good travel hygiene is very important.